One of my innovations in the field of human psychology is the notion of Quadratic Intelligence. Expanding on recent theory and research has helped us beyond the early 20th-century notion of intelligence as only our (IQ) competency in reading, writing, and arithmetic – the so-called academic set. Opening the definition of intelligence so as to include emotional (Goleman, 1995), spiritual (Zohar & Marshall, 2000), and less conscious body processes has liberated discourse on the subject from a crippling Western bias where intelligence equals computation, logical operations, and problem-solving acumen. My insight has to do with seeing these four types of intelligence – Rational, Emotional, Spiritual, and Visceral – evolving together as a system, unfolding in sequence (V-E-R-S) and interacting dynamically throughout human development. Before we move into the diagram and take a look around, one other general comment is in order. 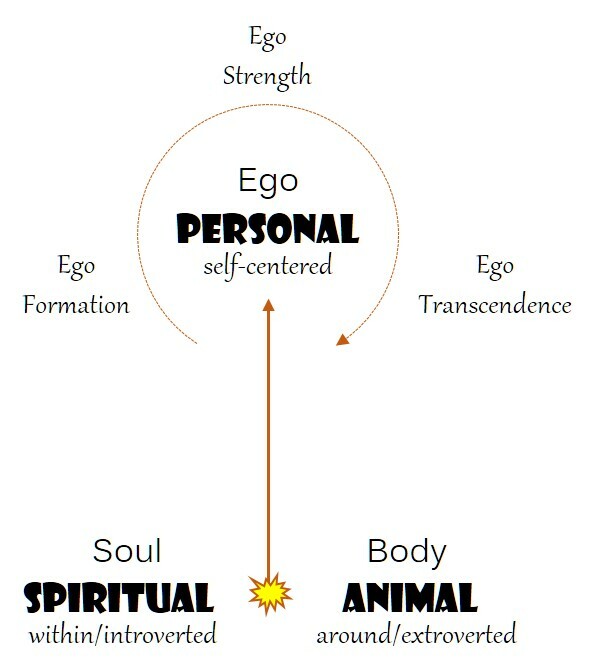 Not only has the West tended to favor rational processes over others, but it also has a long tradition of ‘impersonating the soul’, by which I mean that the center of spiritual intelligence, or soul, has been taken as another name for the separate center of personal identity, commonly called ego (Latin for the first-person singular “I”). This is likely a complication of our deep history in theism, where the formation of personal identity as represented in the deity and managed in the devotee is a prevailing focus of concern. An unfortunate consequence of this confusion is a tendency to associate spiritual intelligence (SQ) with ‘psychic’ abilities, out-of-body experiences, metaphysical visions, and special access to the supernatural. It has also perpetuated an unhealthy dualism that conceives the human being as a body with a soul or a soul inside a body – in either case a deeply divided being. A sick religion that capitalizes on this dualism is obsessed with getting the captive soul safely to its heavenly home, free and far away from the mortal body. Just about everything connected to our physical life as animals – our drives, appetites, proclivities, and secretions – has been put under one taboo or another, as despicable vices that threaten to drag us into hell. So when I speak of spiritual intelligence I am referring to that strand of quadratic intelligence that gives human beings our distinctive creative ability – to imagine, compose, invent, and in various ways transcend the boundaries of our present situation. Soul, then, is not an immortal entity riding temporarily inside a mortal frame, but the very center of this creative intelligence. By extension, spirituality is not only about breaking out and escaping our limitations, but transforming them by virtue of a new perspective, attitude, and mode of life. What I call ‘creative authority’ is this very mode of life whereby individuals take responsibility as creators of the identities, worlds, and relationships that either facilitate or frustrate the realization of their own higher selves and those around them. Just as our thinking mind is no more important to what we are than our feeling heart, neither is our spiritual soul any more special and sacred than our animal body. While our consciousness may be characterized by an inherent duality – introverted to the intuitive-mystical realm within and extroverted to the sensory-physical realm without – we are fundamentally indivisible in our essential nature as spiritual animals. After insisting on the integral unity of our quadratic intelligence I can move on to make the point that each of us develops and demonstrates the four types in individual ways that are unique to our genetic temperament, early upbringing, surrounding culture, pressing concerns, and evolving character. This is where my diagram comes in. Let’s start with a question. From the following four options, which term best describes your preference for orienting and navigating your way through life: strategy, inspiration, sympathy, or common sense? Here are the definitions. You prefer to make plans, set goals, and work through a sequence of tasks that lead where you want to go. This preference suggests that you tend to favor reasonable and creative approaches to the challenges and opportunities of life. If you self-identify as preferring strategy, then you might further refine this preference as leaning more to the rational (RQ) or spiritual (SQ) side. In other words, strategy could be more about detaching from your subjective feelings and staying on course with a prescribed plan, or the value might lie more in how it enables you to transcend the way things are and bring about a ‘new reality’. The unifying idea is the way strategy clarifies and prescribes an overarching purpose in what you do. You seek out experiences that ‘breathe in’ (inspire) greater joy, beauty, and wonder that will enrich your life. This preference suggests that you tend to favor creative and passionate endeavors which connect you to something much bigger than yourself. Depending on how you lean into inspiration it might be more about this feeling of engagement (EQ), or perhaps you would describe it in terms of an inner release and going beyond (transcending) the bounds of ordinary awareness (SQ). It isn’t necessary to postulate a supernatural or metaphysical source behind the experience of inspiration. It simply represents the cooperation of your emotional and spiritual intelligence in taking in ‘something more’ – the whole that is more than the sum of its parts (think of the artistic image that ‘comes through’ the patterns of color in a painting, or the gestalt that rises through the harmonies of individual instruments of an orchestra). I’m using this word in its classical sense, as a resonant response between and among things of similar nature. It certainly takes on an emotional character in the realm of human relationships, in the way individuals are ‘moved’ by the mysterious forces of attraction, empathy, and aggression to match each other’s mood. If sympathy is what orients and motivates you through life, then you tend to go with ‘how things feel’ or ‘what feels right’ in the moment. 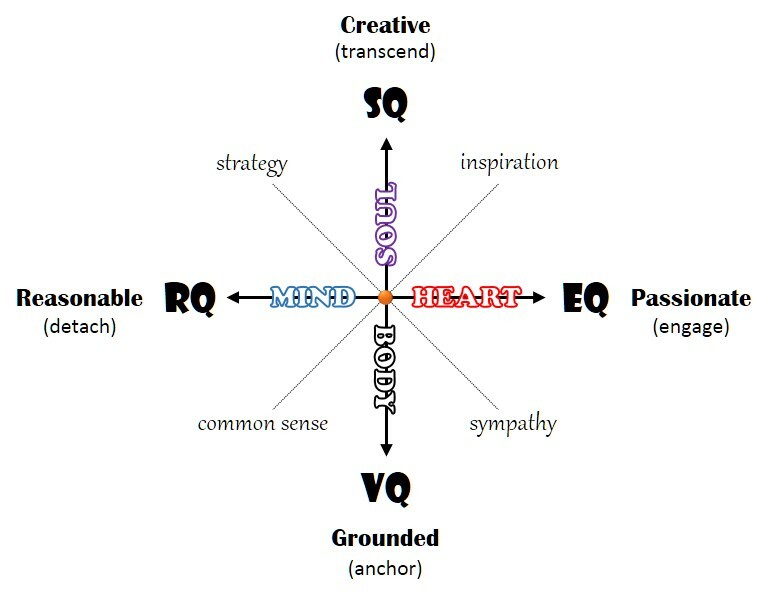 Leaning more on the side of EQ, this is typically experienced as a refined feeling that may prompt secondary reflection, whereas a stronger anchor in the unconscious reactions of the body (VQ) will evoke a more spontaneous behavioral response. Sympathy is the emotional and visceral basis of our more ‘elevated’ intuitions of compassion and empathy. As distinct from them, sympathy is something we feel in our heart and sense in our gut, often as an ineffable reaction occurring prior to any conscious reflection or ethical resolve. Our ‘common senses’ refer to the five sensory-physical modes of perception – sight, hearing, smell, taste, and touch. If this is your preference for orienting yourself in reality, then these sense-data serve as the foundation of reliable knowledge. Just as your visceral intelligence (VQ) anchors consciousness in the organic urgencies of life (e.g., the compulsive urge to breathe), your physical organs of perception tether attention to what we might call the realm of the obvious. The modern school of philosophy known as ‘common sense realism’ (Thomas Reid) shows how this preference can lean strongly to the rational (RQ) side, where even the detachment of our logical mind only infers and constructs from the information apprehended first through the senses. If you are a common sense realist, then you likely insist that truth must derive from, and ultimately come back to, the reality of perceivable facts. My Quadratic Intelligence model allows us to appreciate the multifaceted nature of human intelligence, and helps as well in the need to expand our definition of it beyond one type of intelligence or another. The concept of preference (strategy, inspiration, sympathy, or common sense) can also rein in a tendency to arrange these types of intelligence in a (personally biased) hierarchy of importance. For example, although spiritual intelligence comes online later (i.e., farther into maturity) than visceral intelligence (which is active in the very beginning of fetal life), this doesn’t make it ‘better’ or more essential to what we are as human beings. Indeed there are plenty of examples where our spiritual ability to go beyond (transcend) what is given has inspired individuals to abandon their connection to everyday reality for apocalyptic and otherworldly speculations, which are then professed as divine revelations by these ‘visionaries’ who use them to draw notoriety, influence, and profit. You might struggle at first in closing down on just one preference over others. As well you should, since all of these are at least potentially active in your quest to make sense of reality, connect meaningfully to those around you, and become fully human. Consider arranging all four preferences in an order that reflects your personal Quadratic Intelligence Profile (QIP). Such an exercise might suggest areas that could use more attention and training, to develop yourself in a more well-rounded fashion – although a ‘perfect balance’ among the four preferences should probably not be a goal. It was Socrates who said that “the unexamined life is not worth living.” He is a key figure in the history of Western consciousness and its growing fascination with the self. At that time, Socrates and others were searching out the individual’s place in the comic and moral orders; only later did the obsession collapse into the neurotic variety that sits at the center of our present consumer culture. Our neuroses notwithstanding, the Socratic axiom is still good advice. In fact it may be what keeps our strange species from wiping itself out. In that spirit, I will step through a theoretical model of what makes us human, hopeful that a more accurate and honest self-understanding might not only prolong our stay on this planet but contribute significantly to a future of peace and well-being. The best place to begin is with what I call our essential nature as human beings. ‘Essence’ here doesn’t refer to some absolute and unchanging reality underneath or behind what is evident to our senses. From the Greek for ‘being’ (esse), it simply speaks to what something is, not as isolated and standing apart from everything else, but just as it is, centered in itself. With that in mind, I propose that our essential nature as human beings is best captured in the term ‘spiritual animal’. Other similar-sounding titles have been used in the past, such as ‘rational animal’ or ‘political animal’ (both from Aristotle), and ‘symbolic animal’ (Cassirer). But each of these is based in some capacity of higher intelligence that may be ‘higher’ in humans though not entirely unique to us. Besides, whether we are rational, political, or symbol-using animals, the qualifier in each case says more about what sorts of special things human beings do (or can do), not what we are. As a spiritual animal our consciousness is dually oriented: inwardly to the inner recesses of contemplative life and outwardly to the sensory-physical environment. Spiritual names the inward-oriented, introverted power of consciousness which has prompted the intuition of our essential oneness with reality (within us). This intuition is profound and ineffable, and it lies at the mystical origin of all (dare I say it?) true religions. Animal not only identifies our membership in a ‘kingdom’ of life, but as an adjective it names the outward-oriented, extroverted power of consciousness which supports the perception of our essential relationship to all things (around us). If I use the classical terms ‘soul’ and ‘body’ in connection with this dual orientation of human consciousness, I need to be especially careful not to separate them into opposing ‘parts’ of our nature, where the next step traditionally was to identify with one (soul) against the other (body). So let me stress the point that our essential nature as spiritual animals is a duality in the orientation of consciousness, not a dualism of a mortal body and an immortal soul only temporarily bound together for this earthly life. Our essential nature, in other words, possesses an indivisible integrity: we are body-and-soul, not bodies with souls or souls with bodies. To this essential nature something else is added, and this I call the conditioned self, or ego. Ego is distinct from the spiritual soul and the animal body – remembering that these are orientations of consciousness and not separate parts – by its character as personal. From the Greek, our adjective ‘personal’ refers to a mode of consciousness that is socially constructed, shaped in the role-play of human relationships, and providing the individual with a mask of identity (actually numerous masks) through which we speak (persona) and interact with others. A personality is really a rather loose association of distinct drives, attitudes, and dispositions, with each motivational strand capable of breaking the surface and running the show for a time. The psychologist Roberto Assagioli called these distinct strands ‘subpersonalities’ and regarded the ego as an executive manager of sort, with the (socialized) responsibility of keeping each in its place and a general order overall. Through the process of ego formation, this executive center of personal identity gradually assumes control and conducts the personality according to the moral constraints and expectations of society. When the personality has achieved stability, balance, and unity under ego’s effective management, the developed virtue is known as ego strength. This adventure in ego formation is illustrated at the cultural level in the ascendancy of theism. As the patron deity represents those virtues of character expected of a devotee, god also stands behind and legitimates the disciplinary system that enforces morality. An individual’s subpersonalities, then, have their social equivalent in the many tribal members, each of whom might at any moment attempt to break out and take over. For its part, the patron deity plays the role of ego for the group, asserting the dominant will and keeping order. In a way, Freud’s concept of the superego, not just as the voice of tribal morality over (super) the individual but as a divine ego projected above (super) the group, fits into this picture well. With sufficient ego strength, however, we are able to go beyond ourselves in a healthy and holistic way, dropping deeper into the grounding mystery within and opening to the provident universe all around. This realization of oneness – that I am both a manifestation of and a participant in the present mystery of reality – promises to transform our way of life in profound ways. We can note, for instance, how Siddhartha Gautama, Jesus of Nazareth, and countless other revolutionaries in consciousness challenged the moral conventions of their time and opened the minds of their contemporaries to the sacred mystery at the heart of reality. The examined life is indeed worth living. Despite the fact that so much of religion tends to divide and antagonize (including terrorize), I’ve been exploring its essential function as a unifying force in human culture. We take as our starting point the root meaning of the word “religion” itself, deriving from the Latin religare, to link back or reconnect. Whatever distortions or corruptions it has taken on over the centuries, it seems to me that we should check these against the deeper or original intention of religion before we simply reject it out of hand as obsolete, oppressive, and dangerous. As with everything cultural, religion emerged and evolved over time according to the developmental needs, crises, and opportunities of our species. Stone Age religion certainly looked different from anything we can observe today, though perhaps some strong family resemblance continues in present-day aboriginal societies that still live in close communion with “wild” nature. I’ve promoted a theory which interprets this development of religion as correlated with three centers of consciousness (or mental locations) that open up in sequence and steadily add to our general picture of what is real and what really matters. 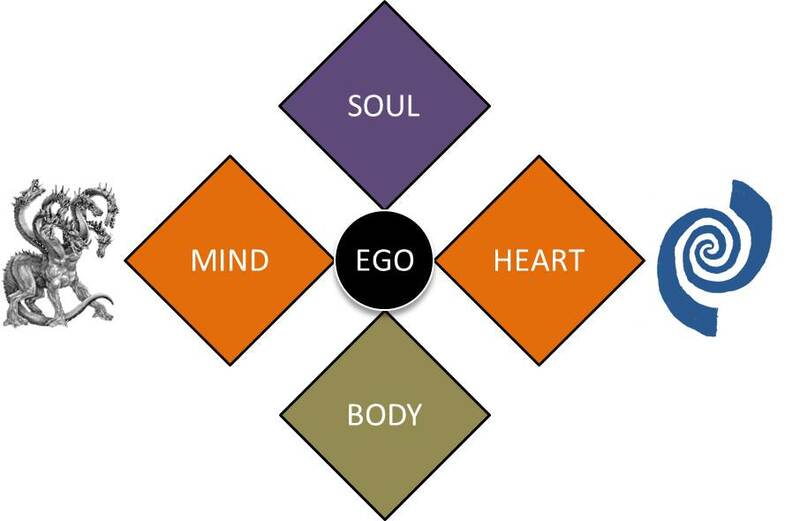 The names of these three centers of consciousness employ familiar terms (body, ego, soul), but with important adjustments from the way they are popularly understood. A primary polarity is represented in body and soul, which simply identify the two directional orientations of human awareness: outward to the sensory-physical realm (body) and inward to the intuitive-mystical realm (soul). These are not “parts of the self” but rather mental locations that open awareness to distinct dimensions of experience. A popular confusion draws an equation between soul and ego, my third mental location. But in fact ego and soul are not two names for the same thing. Soul, once again, refers to our inward orientation and deep inner life, while ego is our socially constructed center of identity. While I admit that an established center of identity (ego = I) is what makes our primary split in orientation possible in the first place, ego actually inhabits its own realm: the socio-moral arena of life in our tribe. 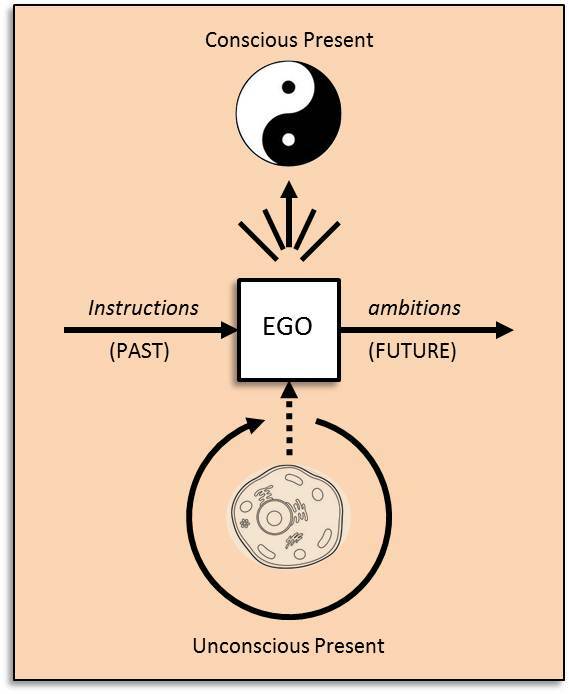 In the above illustration, the primary polarity of body and soul is indicated by a green connector while ego sits on its own. This makes the point that ego is a construct of culture, both a product and symptom of society, which makes it the wild card in our evolutionary adventure. More on that below. Religion is thus designed to coordinate these three centers of consciousness (body, soul, ego) and their corresponding realms. Together these centers comprise the animal, spiritual, and personal aspects of a human being. Our development, as individuals and a species, advances sequentially through stages beginning in the body, moving through an ego-dominant period, and deepening all the while into a more inwardly grounded mode of being. I have designated these general stages of religion as animistic (body-centered), theistic (ego-centered), and post-theistic (soul-centered). Just because development has advanced beyond a stage doesn’t mean that the experiences and concerns peculiar to that stage are no longer relevant. On the contrary, those experiences and concerns are taken up and incorporated into the next stage and updated according to its emergent paradigm of meaning. As the wild card in the set, ego represents a strong element of risk against the eventual fulfillment of this project. In previous posts I have tried to describe the factors that tend to compromise what psychology rightly names “ego strength” – the well-centered self confidence that develops as our needs for safety, love, power and worth are adequately met. In the best of all possible worlds, we grow up in a family environment where these needs are fulfilled and our personal identity (ego) is securely established. Of course, we don’t live in the best of all possible worlds and our caretakers are not perfect. As a consequence, the ego adapts and compensates for the insecurity by defending itself, pretending to be what it’s not, and insisting on being the center of reality. Interestingly, but not really surprisingly, theism – as the model of religion that co-evolves with the ego – often portrays its principal deity in corresponding ways, as craving glory, jealous of rivals, and prone to violence in his campaign for supremacy. Since in previous posts I’ve deconstructed the perverse influence of ego insecurity on the otherwise respectable and developmentally necessary stage of theism, I want to move now in a completely opposite direction with my analysis. It’s easy to commit the mistake of effectively dismissing theism as only a transitional stage (more like a phase) along our way to something better. From my comments on the ego, about the inevitable and worldwide neuroses that pull theism into various dangerous corruptions (sectarianism, exclusionary membership, extremism, and redemptive violence), you might assume I have nothing good to say about either one of them. The diagram above shows where theism fits into the evolutionary scheme of religion. 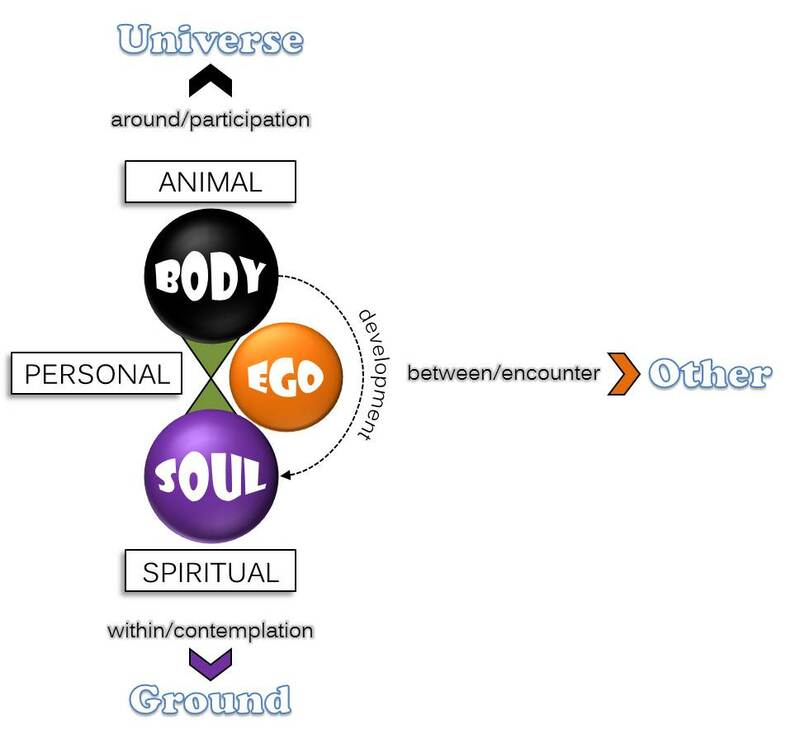 Our animal nature of the body connects us (religare) outwardly to the sensory-physical Universe, while our spiritual nature (or what I prefer to call our higher self) links us inwardly to the intuitive-mystical Ground. Both “Universe” and “Ground” are synonyms of sort, each communicating the idea of oneness: Universe as the nuance of totality (the All), and Ground as essence. As I said earlier, this body-soul axis forms the primary polarity in which human beings live. Ego (our wild card variable) tugs development in a horizontal direction, where we find a third nuance of oneness, encountered as the Other. This, I would say, is the real genius in theism: regarding the present mystery of reality in its specific incarnation as one who stands opposite of me, in a space of absolute difference insofar as the other is deep-down unique and truly an individual (from individuum, the indivisible). In the process of ego development, identity is shaped and challenged in relationship with others who come out to meet us from the dark recess of otherness. We’re not talking about the role-plays of social performance that govern so much of our daily interaction, but about the direct encounter between one self and another. To conceive of God as Other in this sense, as a transcendent and absolute self who comes out to meet us or calls us out of our selves to an encounter, considers the present mystery of reality in terms of a one-to-one relationship. As the Jewish writer Martin Buber explained in his seminal book I and Thou, this faith in reality as arising out of the primal relationship of self and Other frames our whole existence in the dynamics of mutuality, dialogue, estrangement, and reconciliation. This might encourage us to re-read our Bible as a mythological exploration (of quest, encounter, and response) into reality as the reciprocal adventure of humanity’s longing for God and God’s outreach to humanity. To simply take the Bible literally and make God into a literal being (i.e., a god) only serves to strip out its internal complexity, leaving nothing more than supposedly factual reports of supernatural events and once-upon-a-time miracles. When this happens, the Bible becomes, in the words of Francis Bacon, “an idol of the tribe.” It stops speaking and becomes only words. What if instead we engaged the Bible as a literary portrait – really a collection of portraits – of the human being as formed in relationship with Holy Otherness, as falling out of union and trying to hide our nakedness from The Gaze, as distracting ourselves in mediocrity or striving for superiority, and at last hearing the call to an awakened life and returning to intimacy with The One who never left us? That would be a very different Bible from the one pumped from most pulpits today, would it not? As I said at the beginning, our developmental advance from one mental location (and one stage of religion) to the next doesn’t mean that we grow up and get past those deeper needs and concerns. Just as theism doesn’t (or shouldn’t) seek to discredit the animist vision of reality as it sets out to expand on the dynamics of relationship, neither does (or should) post-theism dismiss the genuine insight of I and Thou at the heart of theism as it cultivates a more contemplative engagement with the grounding mystery of Being itself. Our quest for oneness at each stage turns out to be a chapter (and ongoing theme) in the longer human journey to communion. Whether we celebrate our place in the living Universe, reach out with care to the holy Other, or sink inward to the nameless Ground of our being, we are fulfilling a most enduring and sacred of human quests. And now we began to drive through that narrow strait. On one side was Scylla and on the other Charybdis. Fear gripped the men when they saw Charybdis gulping down the sea. But as we drove by, the monster Scylla seized six of my company–the hardiest of the men who were with me. As they were lifted up in the mouths of her six heads they called to me in their agony. But I could do nothing to aid them. They were carried up to be devoured in the monster’s den. Of all the sights I have seen on the ways of the water, that sight was the most pitiful. In Book XII of Homer’s classic Odysseus must steer his ship through a dangerous strait, carefully threading his way between two monsters on either side. 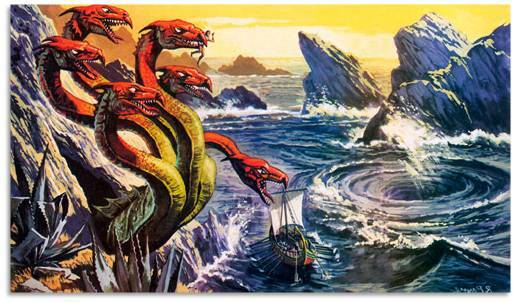 Charybdis is a whirlpool infamous for pulling vessels into its vortex and crushing them beneath the water, while Scylla, on the opposite bank, is a six-headed monster who reaches out and plucks sailors from their decks and devours them whole, if the captain should venture too close. Beyond the strait is a beautiful island where Odysseus and his men will find peace and refreshment. But that fantasy must be suspended in the face of their present challenge. Circe had counseled the captain to not allow his panic over losing his ship to one monster drive him, by overcompensation, into the other. And yet, that’s what happens: In their fear over falling into the swirling void of Charybdis, some of Odysseus’ men scramble to the other side of the deck, whereupon they are snatched up by Scylla and lost forever. In my last post I offered a way of understanding yourself as driven, motivated, and inspired by the impetus of desire. Composed of a sensual, emotional, intellectual and spiritual nature, you seek different types of experiences, satisfying fundamentally distinct needs. The pursuit of pleasure, though exploited by advertising and a slippery slope into addiction, is an evolutionary set-up designed to move you toward what your body needs to live and reproduce. Emotionally you seek happiness, which likely arose in correlation with the strong social affinity of our species. The quest for meaning compels you to construct an intellectual model of reality, called your worldview, that will orient your life inside a context of significance. Finally, your spiritual nature desires authenticity, wholeness, communion and peace – all summarized under the single term well-being. I offer the diagram to the right as an abstract representation of the artistic illustration above, from the scene out of Homer’s Odyssey. The “strait” that Odysseus – Captain Ego – must guide his ship through begins at the bottom of my diagram, which corresponds to the developmental stage of infancy and early childhood. Pleasure and its opposite, pain, were the guides that helped you stay inside that provident niche where your basic needs could be satisfied. Spontaneous reflexes and deep unconscious drives in turn provided clues for your caretakers to know what you needed. Through a process known as socialization, your cultural handlers (parents, teachers and other adult higher powers) exploited this natural preference for pleasure and avoidance of pain, using it to shape you into a “proper” member of the tribe. In this way, “right and wrong” were associated, by the pairing of pleasure (reward) or pain (punishment), to your evolutionary interest in good (pleasant, tasty, nourishing) versus bad (unpleasant, disgusting, toxic). Thus the moral categories of “good” and “evil” have their roots in your natural inclinations. The moral pedagogy of your tribe first anchored into, re-coded, and then abstracted from the sensual intelligence of your body. Because no culture is perfect and no family is without its shadows, your moral development might have gotten hooked and saddled with shame, guilt, and self-doubt. Such complications can make relationships difficult depending on whether you cling to others for security and reassurance, antagonize and push them away, or remove yourself emotionally to avoid being swamped. This is where I see Odysseus as Captain Ego, on the narrow path between Charybdis and Scylla. In the painting above, Charybdis (the whirlpool) is on the right and Scylla (the picker) is on the left – corresponding nicely to the right and left hemispheres of your brain. Although many functions are shared across the two hemispheres and their deeper networks, neuroscience has discovered stronger (more numerous and vibrant) connections between the so-called right brain and the body. Your early development was dominated by right-side processing, which was all about emotional formatting, making necessary attachments, and setting the general “feeling tone” of your emerging worldview. It took a bit longer for your left brain to get involved. Left-side processing involves cognitive functions of denotative language, classification, cognitive abstraction, forming inferences, and constructing theories that explain and predict reality in meaningful ways. This world-building work picked up the deeper emotional codes of your right brain and incorporated them into a more elaborate perspective on reality. So, whereas your emotional right brain communicates with your body and its visceral interior, your rational left brain uses the scaffolding of language to arrange and interpret your external environment. But again, because no one gets through the gauntlet of childhood without bumps, bruises and a few psychological scars, the larger evolutionary task of steering your way between emotional engulfment and intellectual nitpicking – watch Scylla picking off Captain Ego’s crew – can be a tricky ordeal. Perhaps, as happened to Odysseus, there is a tendency in all of us to swing our ship away from the prospect of getting overwhelmed, exhausted in emotional struggle, and pulled down into a hopeless depression. In compensation, we pick things apart, strip out the passion, and lock our life’s meaning inside small stuffy boxes of dogmatic conviction. Either way is death: either the death of enjoyment (happiness) or the death of significance (meaning). It’s possible that an entire lifetime (or more) can be spent tacking back and forth, steering clear of suffering but dying inside our convictions, or refusing to take a stand for anything and consequently falling for (into) everything. The real tragedy, however, is that your spiritual nature and the desire for wholeness, communion and well-being is kept from advancing to the Isle of Serenity beyond. Of course I’m not talking about paradise after you die, but the bliss that awaits your realization this very moment, on the “other side” of the challenge. Between Scylla and Charybdis is a very narrow path indeed, one that requires focus and control, mindfulness and balance, equanimity and orientation, along with a deep internal calm and full release to the present mystery of reality. A large number probably never make it. This mystical faith in being-itself is the only way through. If language had developed along a slightly different track, in addition to speaking of human beings we might today have acquired the habit of referring to “dog beings” and “tree beings,” even “rock beings” and “cup beings.” This fascinating word, being, is mistakenly regarded as a noun when it’s really more a verb: be-ing, the act or process of existing. Being is the dynamic and particular demonstration of existence, manifesting here as human, there as tree, and as a cup on the table (table being) before me. It’s interesting to ponder why language has retained this formal reference to ourselves as human beings – as the manifestation of existence in human form. If we had come to regard this wonderful diversity of beings more explicitly in our language, would we today have a different shared understanding of and appreciation for the way all things are grounded, connected and involved in this one magnificent act of being called the universe? As cohabitants of this universal order, would our tribal values, personal choices, and individual lifestyles have taken a different course, landing us in a very different cultural space from where we are today? Culture itself is a complex system of uniquely human creativity whereby the organic energy (life) of our animal nature (body) is harnessed, redirected, and converted into the social currency of identity (ego), collective meaning, and shared purpose. The organic energy that animates your body is not your personal property, but merely a cresting wave of life as it has emerged on this planet. In its peculiar form, this animal manifestation of life has a deep heritage of instincts. You can think of them as impulses, reflexes and drives that have evolved over many millions of years to protect and promote the vital urgencies of life as it rises in the organism you are. This “urgency” represents the place where your life is absolutely dependent on the support and resources of the natural environment. The part of your brain responsible for regulating the syndrome of urgencies that is your biological life does its business far below your conscious awareness or direction. It lives in the unconscious present. If life itself is not your personal property, the tribe works on you to cultivate an identity and mindset – equipped with a distinctive vocabulary of “I, me, mine” – that regards this body as “my body, belonging to me.” As you occupy this standpoint in reality, it makes sense to speak in personal terms. Although your personality is rooted in genetics and a deeper animal temperament, its fuller development is a social construction. Human societies tend to favor “insiders” over “outsiders” as bearers of value and meaning. This insider preference not only translates into a politics of “us” and (versus) “them” on the personal level, but it has also forced a somewhat pathological separation between identity and embodiment, ego and body, technical control and the natural order, human beings and “only” dogs, trees, and rocks. Most religions construe salvation as a rescue mission – getting ego out of the body and safely to heaven. But from the standpoint of the soul, this only magnifies the real problem, which is that we are divided within ourselves. Of course, “I” (ego) want to live without pain, without stress, and without the burden of mortality … forever and ever. When ego (the social construct of personal identity) took on this role of a lifetime as impersonator of the soul, the wholeness that is the true meaning of salvation (salvus = to heal, make whole) and the higher quest of our spiritual life was forfeited, or at least postponed. As long as the principal goal of religion continues to be rescuing “me” from my body and this sinful world, the soul’s quest will be frustrated. I am suggesting that the evolutionary goal of “true religion” is actually the opposite of what it has become in conventional religion. Rather than accomplishing a rescue mission – whether it is permanent (everlasting) or only temporary (as in the hopelessly confusing orthodox Christian notion of resurrection, where the already-saved ego is reunited with its body for final judgment) – salvation for the soul is about coming back to the body. In a kind of “reincarnation,” the once-split and internally conflicted human being is reconciled and made whole – in this life. A human being is a distinct expression or manifestation of being-itself. Over there, being is expressing as a dog, as a tree, and as a cup on this table. Each manifestation of being (human, dog, tree, etc.) carries this deeper ground into the nature, form, properties and attributes of its unique expression. From the standpoint of ego, where personal identity (as “me”) is a socially supported preoccupation, this talk of a ground of being threatens to dissolve away what makes me special. And yet, the experience of absolute release to the present mystery of reality is a celebrated moment of realization for mystics everywhere. This is where you understand intuitively (not by logical argument) that “it’s not about me.” There is an intention to your existence, an evolutionary aim in what you are, which is to become fully human. As long as captain ego is gripping down on “me and mine,” this otherwise very natural flow of human energy will be cut short of fulfillment. Let’s not be surprised any longer that frustration and stress, anxiety and depression, conflict and violence are destroying our health, international community, and the biosphere of this planet. We should expect more of the same if nothing changes within ourselves. So come back to the present moment. Your body has been here all along. Breathe in. Breathe out. Reach in to the ground and touch the source. Reach out to the universe and be at home. You are a human being, so be fully human. 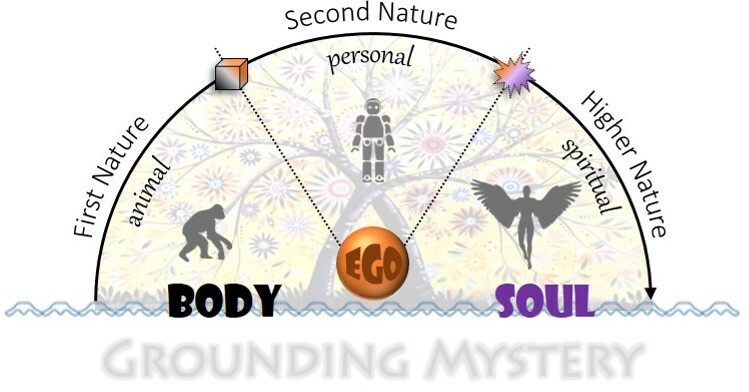 According to the conceptual model that I’ve been developing, the familiar designations of body, ego and soul refer to distinct mental locations, or standpoints in reality. Traditionally, the dualism of body and soul has dominated the conversation, with ego sneaking into the meeting relatively recently. Soul was identified early on as the “true self,” with body its temporary container. 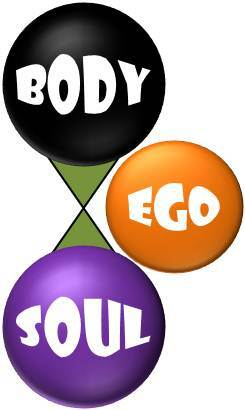 Now ego has become another (albeit more psychological than spiritual) name for the soul. This confusion of terms, along with the tendency in metaphysical realism to make the soul into a “separate thing,” and the tendency in scientific materialism to reduce the soul first to the ego (personality) and then to the body, leaves one to wonder whether re-definitions are even advisable at this point. Perhaps we should simply scrap the traditional vocabulary and move on. Such frustrations as this are common in transitional periods of culture, when the vocabulary that supported an earlier (but increasingly outdated) worldview is still being pressed into the service of constructing meaning. Of course, archaeologically it is expected that by stepping back into the mind-space of ancient languages we today can reconstruct how earlier cultures saw the world. But we also need to make sense of reality for our time, and we are stepping into a decidedly postmodern period of history. So in the interest of reinterpreting the traditional terms of body, ego and soul for a relevant postmodern conversation, I am offering this notion of standpoints in reality. Another spin through this vocabulary revision might help put things in perspective. The diagram to the right is intended to be read from the bottom-up. I’ve arranged it this way to acknowledge the organic and evolutionary nature of the topic under consideration – i.e., what is a human being? Living things tend to grow “up,” which means that human development can be understood as progressing through phases of growth, perhaps even according to specific “stages” of relative completion along the way. If a stage can be thought of in the spatial sense, as a specific location where one can stand and take a perspective on things (as on a theater stage), then we are very close to my notion of a “standpoint in reality.” Each stage or standpoint (body, ego, soul) provides a unique mental location where a human being engages reality. The present mystery of reality is thus revealed to us as three distinct realms: sensual/nonpersonal, social/interpersonal, and spiritual/transpersonal. Body is represented in my diagram by a circle, or more accurately a cycle. The body functions as an energy converter, taking up the vibrational oscillations of inorganic (air, water) and organic matter (food), dismantling and re-engineering it into more energetically “open” packages of living cells. With an evolutionary history of millions of years, the body is animated by powerful urges and instincts. The very fact that I’m here right now is a credit to the success of these drives and reflexes in my pre-human and human ancestors. It stands to reason that I should be able to trust this animal intelligence for continued evolutionary success – if it weren’t for the additional fact that I’m involved in a tribe. 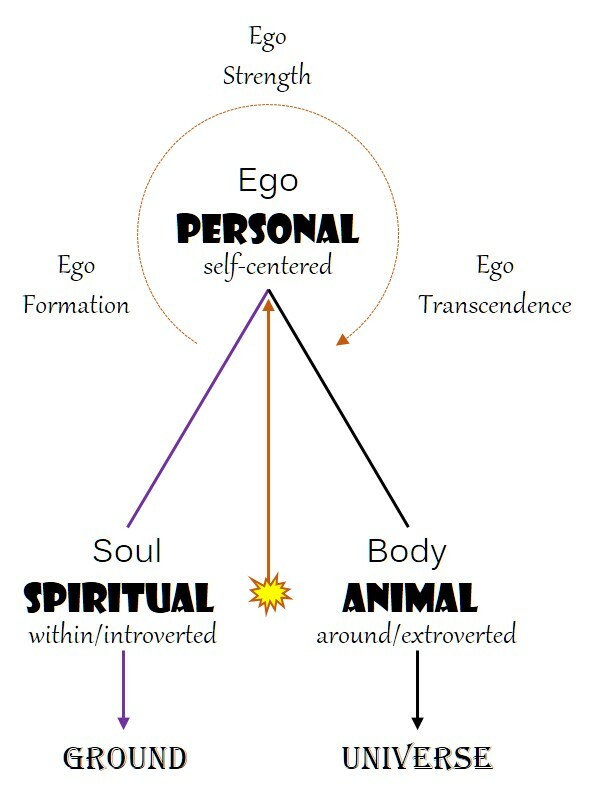 Ego is represented by a horizontal line moving left-to-right, which stands for the developmental project of constructing an identity – a “one of us.” The tribe must work with the body’s animal nature, in the interest of training and channeling its instinctual energy into behavior that supports (or at least doesn’t interfere with) social order. Sometimes this means working against its urgencies and impulses, putting restraints in place to keep it under control. This process of imposing restraints, incentives, and permissions on an animal nature in order to shape a self-conscious identity (ego) is summarized in the term “instruction.” The most important part of constructing this “one of us” involves instructing it with the rules and values of our tribe (family, clan, club, culture). This is Nietzsche’s “morality,” and while he didn’t appreciate the way it can frustrate human freedom and stunt human creativity, some such system of constraints is necessary for a peaceful and productive coexistence. Because ego is a product of past instructions and a project of future ambitions, the present moment is nothing but a vanishing threshold between its twin obsessions. And if early socialization involved neglect, abuse, or repression, then the personality might host a significant “shadow” of insecurity, shame and resentment. The shadow tends to pull the ego into earlier configurations of itself where the personality got hooked or held back. When the personality gets hooked in this way, ego might compensate – sometimes with considerable assistance from the tribe – by projecting the shadow forward and ahead of itself, into moral crusades against those who express outwardly what it can’t accept in itself. Since the shadow can also include talents ignored or left undiscovered, ego can become a relentless critic of those more courageous and/or successful. As each of us is aware, the social realm of ego and tribe can be endlessly fascinating. Because dualism – past/future, shadow/mask, self/other, right/wrong, and good/bad – is woven into the very structure of identity itself, an entire lifetime can be spent sorting it all out. A spiritual consequence of this is that the individual may very rarely, if ever, become consciously present to the mystery of reality. As I said, the present moment is inaccessible to the ego, whose identity is stretched between past (instructions) and future (ambitions). About the only way ego can add value to time is by extending it indefinitely into the future. As its developmental antagonist, the body, is time-bound and mortal, ego took to itself the virtue of everlasting life. But everlasting life is just “more life, without end.” In order to experience true immortality, the individual must break past ego altogether. In the standpoint named soul, reality is experienced as the timeless ground and always-present universe of being. The ground invites awareness by an inward path into the depths of being-itself, beneath and prior to the separation of ego. Mindful breathing is a widely practiced meditation technique that brings conscious attention to the softness and gentle rhythms of the body. Drop your concerns, set thoughts aside, let go of “me,” and just sink into this present moment. This is the “narrow gate” – invisible to the ego – that opens to an ineffable and unqualified mystery. The universe elevates and expands awareness beyond the ego by a different path. Spiraling out, around, and beyond “me” is a wondrous and apparently infinite community of beings. In this moment I am connected to all things, and all things are turned into one (“uni-verse”). It is astonishing just to consider a provident universe, where conditions are just right (at least in this corner of reality) to support the emergence of life and the evolution of consciousness. Attention itself is a miracle. In the standpoint of soul, this present moment is all there is. Grounded and connected, ego is transcended and all personal references are left behind. Here and now, I am whole and all is one.